Dashboard gives you the data you need when you need it and in the format you want. You can see data and analysis at both the portfolio and project levels. Both you and other users can personalise your experience. You can choose your own set of properties for the project from the extensive set of properties. 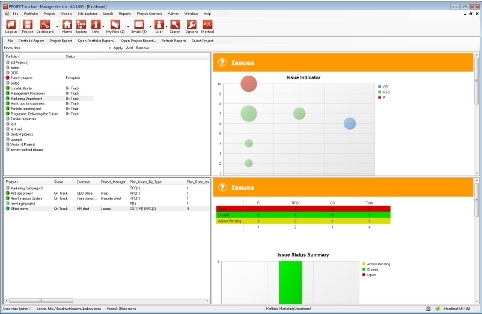 Your properties include system level properties and key stats from the project controls database. Users also often set up additional data properties to be loaded from project spreadsheets. Depending on what you want to look at you can move between different sets of saved properties using a ‘view’ either pick your a view preset by your admin user or create your own personal ones. Users can also choose the areas of analysis for the projects or Portfolios. 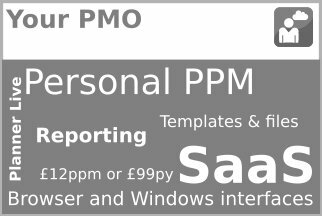 These Analysis Panes use pre saved report definitions and this means that you can use the extensive range provided as standard or personalise these yourself using your favourite views or even bringing up custom data loaded into the project from spreadsheets by the PM. You can save your favourite combinations of analysis pane for quick viewing and again we have provided a standard set of these favourites to help you get up and running quickly. System level properties enable you to decide what sort of properties are to be collected for your projects, of course we provide a helpful starter set but you can personalise these to match your requirements for statuses, dates, descriptions, roles and anything else you need. Then use views to manage them easily. Depending on your permissions you may be able to update properties one project at a time or across all the projects in a portfolio in an easy management form which even supports copy and paste. 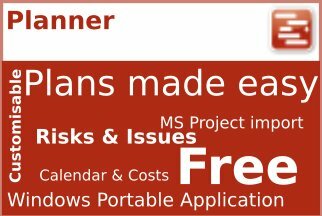 When used in combination with Bulk project creation this is great when setting up many projects i.e. a new programme or the beginning g of he new financial year. The Browser App also includes a dashboards facility which provides Portfolio and project properties to assist in selecting the Portfolio and project of interest and then you can run one of the Project or Portfolio reports with one click from pick list. Using this you can get live dashboards on your tablet or smartphone whenever you want them. 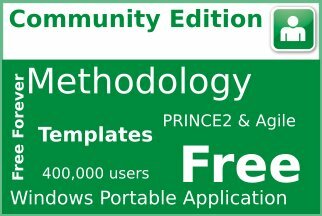 Community Edition – No reporting provided. 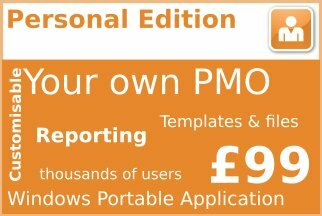 Personal Edition – Core reporting supported including producing poster reports, project and portfolio reports and also project document assurance. 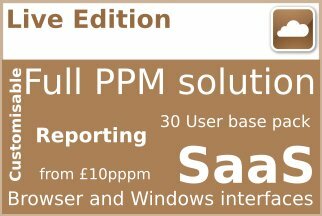 The report publishing capability is not available on Personal Edition. 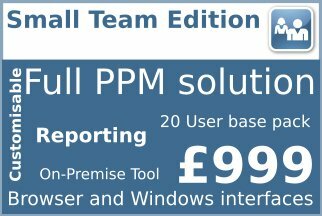 Small Team Edition – Full project dashboard capability supported on Small Team Edition. Two users have access to the dashboards. These users can also publish them to the Report Library to share with the rest of the team. 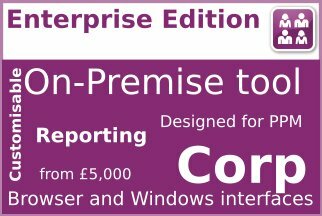 Enterprise and Live Editions – Full project dashboard capability. You choose how many ‘Manager’ type users you want to use dashboards.